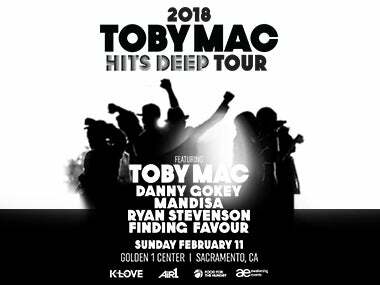 SACRAMENTO, CA - Food for the Hungry presents the TobyMac: Hits Deep Tour 2018. TobyMac is back with another star-studded lineup for this year’s Hits Deep Tour. Joining Toby will be Mandisa, Danny Gokey, Ryan Stevenson, and Finding Favour. New for 2018, a 20% discount will be offered during the first weekend of sales only. Use the code “INSIDER” from on sale 9/29 –11:59 pm 10/1 and you can save 20%. Tickets will go on sale September 29, 2017, at 10:00 am. Tickets and more information will be available online atwww.awakeningevents.com. About TobyMac: With more than 11 million units in career sales and a whopping seven Grammy® Awards, TobyMac's career continues on the fast track. His most recent studio album, This Is Not A Test garnered a Grammy® Award, Billboard Music Award nomination and a high marking debut at No. 4 on the Billboard Top 200. Each one of his previous five studio solo projects have achieved Gold certification, a first for an artist in the history of his label, Capitol Christian Music Group. Among those honored with Gold certification, Eye On It, which debuted atop the Billboard 200, only the third ever Christian album to do so. His previous live DVD, Alive & Transported, is RIAA Certified platinum and received a Grammy® award. About Mandisa: With more than 1 million records sold, Grammy® winner and American Idol Season 5 finalist Mandisa is a voice of encouragement and truth to people facing life's challenges all around the world. In less than a year, Mandisa performed her three hit singles "Overcomer," "Good Morning," and "Stronger" on the highest rated morning show, ABC's Good Morning America (GMA.) Her performance of "Stronger" welcomed the emotional return of beloved morning host Robin Roberts. The NFL also welcomed Mandisa to perform the national anthem during a Sunday night NFL Network game to kick off Breast Cancer Awareness month where she was joined by members of the 49ers family who are survivors. Her album, Overcomer, released August 27, 2013, and debuted at No. 1 on the Billboard Christian Albums Chart, with the album's title track proving to be a smash at radio Mandisa, was awarded a Grammy® for Best Contemporary Christian Music Album for her best-selling and critically acclaimed project Overcomer. Additionally, "Overcomer's" songwriters (David Garcia, Ben Glover & Christopher Stevens) won the Grammy® for Best Contemporary Christian Music Song. About Danny Gokey: BMG recording artist Danny Gokey became a favorite of millions of fans as a Top 3 finalist on Season 8 of American Idol. His first album, My Best Days debuted at #4 on the Billboard Top 200 album chart. Following, Danny has celebrated a series of #1s including his first Award-winning holiday album, “Christmas Is Here,” as well as singles including “Hope In Front of Me” and “Tell Your Heart to Beat Again.” Gokey’s latest album, Rise, reached #1 on the Billboard Top Christian Album chart and its title track, and first single, marked Gokey’s third #1 song. About Ryan Stevenson: Following a seven-year stint as a paramedic, Pacific Northwest native Ryan Stevenson signed an exclusive agreement with Gotee Records in 2013 after capturing TobyMac’s attention by co-writing the No. 1 and Grammy® nominated single “Speak Life," His first recording for the label was the Holding Nothing Back EP in 2013, which garnered the Top 25 single “Holding Nothing Back. This was followed by 2015’s full-length album Fresh Start which featured the No. 1 radio single “Eye of the Storm.” With three No. 1 singles (two as an artist and one as a co-writer), a Grammy® nomination, ASCAP honors and major tour bills with the likes of TobyMac, Newsboys and Matt Maher, among others, Ryan has already distinguished himself as a rare talent whose unique perspective guides his honest lyrics and sonic sensibilities. About Finding Favour: A big part of what makes Finding Favour so endearing is that they’re relatively normal guys. They’re family men who like to hunt & fish, enjoy quiet nights in the country, and don’t know or really care about this year’s fashion trends. That said, what comes with the territory of ‘normalcy’ are standard feelings all men deal with—like a desire to be respected, accepted and understood. And the fear that creeps in at the thought of those desires falling short. Naturally, Finding Favour (Blake NeeSmith, Allen Dukes, Dustin Daniels, Matt Pacco and Jon August) know these fears all too well. Or did.